Just outside the heavy cabin door is a members-only retreat. Your balcony, that is, a private 35- to 1,000-square-foot space for watching sea spume float by and spying on your neighbors -- but also cracking open a lobster tail, ogling high divers flip and twist into a pool 60 feet below and hosting a cocktail party for two or 20. Thanks to public demand, today's new ships include an ever-increasing ratio of balconies, making the once premium-priced accommodations accessible to the masses. Of course, you can always splurge on a suite, which can transform the standard two-chairs-and-a-table setup into a sanctuary with thickly padded chaise loungers, a hot tub and a wet bar. But a 10-by-5-foot swath of treated wood is plenty big for most pursuits. Behold our list of eight things you could (and should) do on your balcony -- and two better off done elsewhere. For a feast with a view, Princess Cruises' has the "Ultimate Balcony Dinner." The $100-per-couple package consists of a pre-meal cocktail; flowers; a four-course dinner with lobster tail, filet or both; a half-bottle of Champagne and a souvenir 8x10 photo. 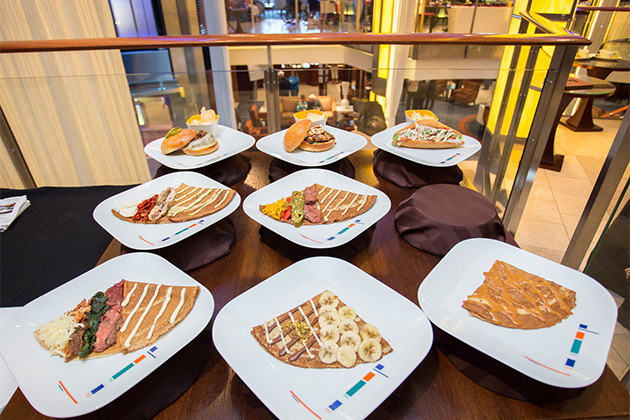 There's also a cheaper option for breakfast ($45 per couple), which includes pastries, options like smoked salmon and a half-bottle of Champagne. 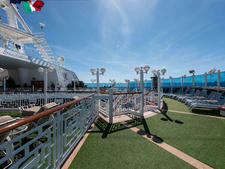 Booked on a luxury line like Crystal Cruises? Course-by-course balcony meals are part of the fare -- but you'll have to pay extra for the commemorative photo. The AquaTheater Suites on Oasis of the Seas, Allure of the Seas, Harmony of the Seas and Symphony of the Seas offer arguably the most intriguing views at sea: an outdoor, pool-based show that features high-diving, synchronized swimming, trampolining and contorted-looking feats of strength that elicit equal parts ooh and ahh. 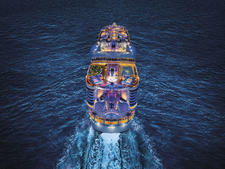 On each ship, these prized accommodations have expansive wraparound balconies that overlook the outdoor amphitheater. These suites don't come cheap -- expect to pay at least $450 per person, per night. For the poor man's version, some of the inward-facing Boardwalk Balcony cabins near the stern are also prime spots from which to watch AquaTheater performances. While it only takes two to party, passengers in suites with apartment-sized verandas can host larger affairs with cocktails and canapes. Regent's Seven Seas Explorer's Regent Suite has a 1,147-square-foot balcony -- more than plenty of space to congregate with fellow cruisers. Few lines have formal "party packages," but hors d'oeuvres and beverages can almost always be delivered upon request. (Ask at guest services.) And, even if you don't book with a luxury line, balcony life can still be sweet. For example, passengers staying in Penthouse Suites on Celebrity's Millennium-class ships have butlers to plan and arrange the party for you. Did we mention Millennium-class Penthouse balconies measure almost 1,100 square feet? One caveat: Make sure you know the rules; Norwegian Cruise Line, for example, discourages passengers from hosting parties on balconies. Many cruise to escape routine, but here's one worth embracing: coffee at sunrise, cocktail at sunset. Mixed with salty sea air, the combination is addictive. Enough said. There's a legion of stern stalwarts who prefer the backside to the port, starboard or bow. We're talking, of course, about the coveted aft balcony cabin, from which the views of the ship's wake (and possibly trailing vessels) are legendary. 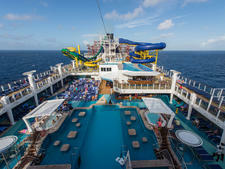 You can jostle with 1,000 passengers for top-deck space during sail-away -- or you can lean on the railing of your balcony as your ship heads down the Hudson past the Statue of Liberty in New York or into the cliffside port of Santorini, with its white-cube buildings stacked hundreds of feet above. It does pay to know your left (port) from your right (starboard), as you'll know which side of the ship offers the best views. Where to find this essential info? Cruise Critic's Starboard vs. Portside feature. For uninhibited stargazing, consider a mini-suite on Princess' Grand- and Crown-class ships. One deck of these ships juts out from the superstructure, meaning that the balconies are exposed from overhead. Sure, your neighbors can peer down at you, but come nighttime, you can peer up without obstruction at the billions of far-off suns. Want to foil peeping toms? 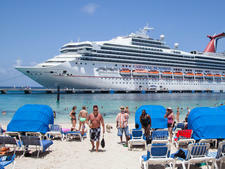 One Cruise Critic reader suggested packing a beach umbrella. Pull up your chair, prop your feet on the railing (or the other chair) and curl up with a book. After a time, you may notice certain symptoms: eyelids growing heavy, vision blurring, head nodding. Don't fight it. Balcony acolytes swear by the rejuvenating power of snoozing to the whisper of ocean breezes and the ship gently carving a path through the sea. Or head indoors, but bring the sea sounds with you by leaving the door ajar. Most lines discourage the open-door practice, as it can impact the ship's climate control, but few if any specifically say "it's against the rules." Over the past few years, smoking on private stateroom balconies has been banned on almost all cruise lines. Citing fire as the No. 1 hazard at sea, cruise lines have come together to limit cigars, cigarettes and even vapes and electronic cigarettes to dedicated public zones of the ship. Also, plenty of cruisers complained about not being able to enjoy their own balcony because of wafting fumes. Those who can't help lighting up on their balcony might have to pay a fine if caught, or worse: get kicked off the ship. Besides reading, sleeping and pondering the infinite, an awful lot of our readers suggest that getting intimate is a common balcony pastime. (We have no proof, of course, but the anecdotal evidence is overwhelming.) Whatever your take on the amorous alfresco activity, we will say this: Be careful. Reportedly, a 20-something pair on a Princess cruise were engaged in a balcony rendezvous before falling overboard into the Gulf of Mexico. Princess never confirmed or denied the report, but a spokeswoman did tell the Houston Chronicle the line knew what happened, calling it a fluke thing.) Fortunately, both passengers, who were not wearing life jackets, were rescued after four hours of treading water. Moral: Don't be those people.